This contemporary mirror certainly fits the bling part of the brief for the Black and Bling Bedroom. The sliver leaf detailing together with the hand-cut crystals really create a unique frame for the mirror. The two lamps not only add to the design but are an addition that make this mirror ideal to use for applying make-up or indeed just to illuminate this piece so that it really stands out. A piece like this is a real investment and ideal if you want to create a room that not only gives you personal satisfaction but that will be remembered by those who view it. If you are in a position to blow the budget by all means go for this piece. If however, like many, you have limits in this department I have suggested a more budget friendly alternative below. 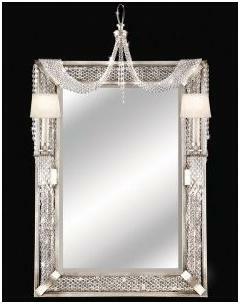 The Cascades 2 Light Mirror in Warm Silver Leaf with Hand-cut crystals is from Fine Art Lamps. Its dimensions are 58”Hx35”W and will require a plug in connection for the lamps. You will find more information and pricing at Amazon.